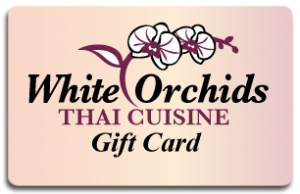 At White Orchids Thai Cuisine we have gift cards available for any occasion! The gift cards come in any dollar increment. Stop by to pick up your gift card today or order Online and we’ll mail it! E-gift cards are also available!